Very few times will a sequel surpass the quality of it's predecessor. There was a time when a sequel was meant to further the story of a particular franchise. That time is gone, but we still have DVD residue from that period left on our hands. 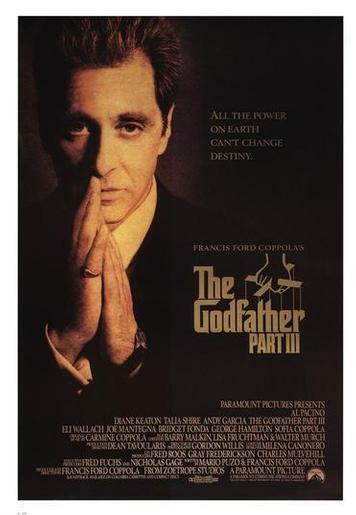 "The Godfather Part II" is certainly a great movie, perhaps greater than "The Godfather." While this is a rarity, is not without president. The real question is why would Coppola and Puzo take a franchise that was virtually unblemished and make a third movie? The Internet Movie Database (IMDB.com) recently featured an article in which Al Pacino said what we all thought, that he regretted making the third installment. Coppola, the director who reached his prime in the 70's and has since fallen from grace, certainly would acknowledge his regrets if ego was not a factor. The second of the Godfather films does end in such a way that questions are left unanswered, stories unfinished. Still, it would have been leaving much to the imagination rather than producing the failed epic "Godfather Part III." Michael Corleone (Al Pacino) is old and slowly inching towards a legitimate family business. The sins of his past haunt him, torture him. But he has his daughter, Mary (Sophia Coppola), and son, Anthony (Franc D'Ambrosio) to keep his spirits up. The film opens with a reception for the family's charitable foundation. In a short span, we are introduced to the necessary performers much like we were in the wedding scene in "The Godfather." The loose cannon son of a Corleone (Sonny, specifically), Vincent Mancini (Andy Garcia) noisily creates headaches for his uncle. He is unpleased with the work he does for Joey Zaza (Joe Mantegna). He moves under the watchful eye of Michael and disrupts what was a happy family. The Corleones are setting up the purchase of a major business entwined with the Catholic Church, leading to negotiations and betrayals that color the entire film. Tom Hagen (Robert Duvall) is inespicably missing, though his death is mentioned with vague desriptions. So, that leaves the perennially tan George Hamilton to serve as the family's lawyer. The third film in the series tries to deal with redemption and the continuing theme of family. While each of the first two installments took our preconceptions of the American family and turned it on its head, the third tries to do likewise but falls short. Michael longs to reconcile with ex-wife Kay (Diane Keaton). He seemingly holds on to his relationship with his two children as though it were his last connection to the human race. Mary begins to get all hot and bothered about her cousin Vincent, which of course leads to disagreements within the family. Connie (Talia Shire) makes significant steps into becoming the key influence on the family, backing Vincent's ascent through the ranks and consoling Michael as he wrestles with his demons. It sounds compelling. It should have been compelling. It would have been compelling if not for the ham fisted ham-handed direction and dialogue. Characters that were quiet goliaths become flashy dialogue spewers. The relatiuve grace of the first two films is dropped in favor of obvious staging of events. And the dialogue...it's bad. While the first two films contained some of the most famous lines in movie history, the third relies on blunt belchings of the English language. Al Pacino, so amazing as Michael Corleone before, is reduced to the over-acting extravaganza that he has become famous for with his contemporary films. Andy Garcia, nominated for a Best Supporting Actor Oscar, seems like only a rehash of his character's father. New dimensions are missing and we are left with what could have been a great character but only amounted to an entertaining one. And Sophia Coppola, the critically declared "downfall of the series," is not rightfully deemed. Sure, she delivers an awful performance, but the problems with the film are too numerous to put the blame on the shoulders of a girl going through the motions for her daddy. As a stand alone film, I fear "The Godfather Part III" is a bad film. But, taken as the last installment of the series, it earns a leery recommendation mainly for its excellent tragic ending. The suspense increases ten-fold within the last twenty minutes and it leaves you shocked and strangley unsurprised at the same time.